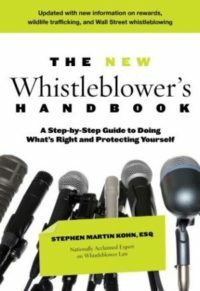 Part of the “Quick Peek” Series, exploring the NEW edition of Stephen Kohn‘s Whistleblower’s Handbook. Stephen M. Kohn, Executive Director of the National Whistleblower Center and author of the Whistleblower’s Handbook, asserts that the history of whistleblower laws stems from an attempt to answer the question: “What to do if the boss is a crook?” Many employees see corrupt practices in the workplace but don’t report them because they fear retaliation. But thanks to the fifty-five federal laws protecting whistleblowers from that exact fate, employees are free to report illegal activity without the fear of being fired or other forms of workplace retaliation. In Nancy M. Modesitt’s recent research article “The Garcetti Virus,” she explains how a doctrine known as the job duties exclusion has come to erode protections once afforded to whistleblowers. She explains that this doctrine allows the discharge of an individual who discovers illegal activities while performing his or her job and then reports those issues to a supervisor. Although one might think the current whistleblower laws would protect such disclosures, Modesitt explains that is no longer the case. Modesitt details how the the Federal Circuit created the job duties exclusion more than a decade ago in the case of Wills v. Department of Agriculture (1998). The case involved an employee in the Department of Agriculture who reported to his supervisor that a number of farms he had investigated were not complying with a government soil-protection program. The supervisor disagreed with the employee’s findings and overruled him on 6 of the 7 cases. The employee complained about the decision and later claimed that he was retaliated against for his comments. When the case was heard by the Federal Circuit, the court decided that the employees comments did not put him “at personal risk for the benefit of the public good.” As such, the court ruled that his comments could not “constitute a protected disclosure under the [Whistleblowers Protection Act (WPA)].” In later cases involving disclosures made by federal employees, the courts further limited the protection afforded to them for their whistleblower activities. In a long-awaited ground-breaking decision, the District of Columbia Court of Appeals today held that an employer engages in unlawful retaliation when it adds a new demand for a release as a condition for concluding a consulting agreement. The case is Propp v. Counterpart International and LeLaulu, No. 07-CV-988 (D.C. Mar. 8, 2012). Counterpart International is a nonprofit development organization. Brian Propp worked for Counterpart from 1995 to 2004. In 2001, Propp was promoted to General Director of Counterpart’s Humanitarian Assistance Program (CHAP). His duties included fundraising. He also led the Counterpart Communities initiative which became known as his "brainchild." Lelei LeLaulu became Counterpart’s President and CEO in 2002. In 2004, LeLaulu proposed to the Board that Propp be terminated due to a budget deficit in Propp’s program in Muldova and CHAP’s overall budget reduction. The Board approved of the termination. Propp was the only person laid off. Before anyone told Propp about his termination, Congress voted to give Counterpart $12 million. In a later meeting with Propp to tell him about his termination, LeLaulu offered him an opportunity to receive three months’ severance pay in exchange for a release of all claims. Propp refused. Nevertheless, the parties agreed to have Propp continue working for Counterpart as a contractor. LeLaulu sent an email to all staff saying that Propp would now be working on Counterpart Communities and other initiatives, but not on CHAP. A week later, Propp’s attorney sent Counterpart a letter asserting that Propp was opposing practices he believed were discriminatory. Counterpart and LeLaulu then became non-responsive to efforts to conclude the negotiations for a new contract. Instead, they insisted that Propp sign a release, and even gave him a 48-hour deadline to do so. Counterpart also abandoned the $12 million earmark from Congress. On October 7, 2005, Propp filed his lawsuit alleging discrimination and retaliation. During discovery Counterpart admitted that “Defendants never engaged or otherwise permitted [Propp] to concentrate on Counterpart Communities and other strategic opportunities for the organization because [Propp] refused to sign a separation agreement and release.” The DC Superior Court still dismissed the lawsuit on summary judgment. Propp appealed only the decision that dismissed his retaliation claim. He argued that Counterpart and LeLaulu added the requirement for a release only after Propp opposed unlawful discrimination. Today, the DC Court of Appeals agreed that adding the requirement for a release was retaliatory and unlawful. This morning, the Supreme Court declined to hear two cases that raise a conflict among the circuits about whether the First Amendment protects government employees who refuse to make false statements. The Court denied petitions for certiorari by David Bowie, a former official of the District of Columbia (DC) Office of Inspector General (OIG), and by Matthew Byrne, Police Chief of Middletown, New York. Bowie had lost his First Amendment case in the District of Columbia Circuit. Meanwhile, the Second Circuit held that Byrne had to answer Jason Jackler’s claim that he suffered retaliation for refusing to make false statements in an excessive force investigation. The Supreme Court’s decision to avoid the issue means that public employees in New York, Vermont and Connecticut will have protection when they refuse to make false statements, but those in DC will not. The rights of public employees in other states remains undecided. The outcome for David Bowie is particularly troubling. According to the Second Circuit, Bowie was the Assistant Inspector General of the Investigations Division at the OIG from November 1997 until his termination in August 2002. DC officials say they fired Bowie for performance problems. But Bowie says his termination was to punish him for supporting Emanuel Johnson, a subordinate whom the OIG fired over Bowie’s dissent. Bowie and Johnson had worked together in a class action race discrimination lawsuit against the Federal Bureau of Investigation (FBI). Inspector General Charles C. Maddox, told Bowie that FBI Assistant Director Jimmy C. Carter had threatened not to "provide any assistance or cooperation with the [OIG] in investigative matters" if Johnson was involved. Maddox ordered Bowie to fire Johnson, and Bowie complied in 2000. After Johnson filed a race discrimination complaint, DC’s attorney and the OIG’s attorney ordered Bowie to sign an affidavit about Johnson’s performance problems. Bowie refused, citing "misstatements of fact" and "language that would convey impressions that [he] would not agree with." The OIG attorney invited Bowie to prepare his own affidavit, which Bowie did. That affidavit cited one performance issue, called Johnson an otherwise "model investigator," and recounted how Bowie wanted to keep Johnson employed. The OIG decided not to use Bowie’s affidavit in defense of Johnson’s claim. Thereafter, Bowie’s performance appraisal’s dropped, he was removed from a high-profile investigation, and a subordinate was promoted to a superior position. Management criticized Bowie for "not stepping up to the plate" and for overprotectiveness toward his subordinates. Eventually, Maddox fired Bowie in 2002. This week, the National Labor Relations Board (NLRB) issued a major decision holding that employees have an inalienable right to bring collective and class action lawsuits. The National Whistleblowers Center (NWC) joined with the National Employment Lawyers Association (NELA) and other groups in an amicus brief to urge the NLRB to reach this decision.